Philadelphia — In Philadelphia, 60 percent of all older adults report eating two or less servings of fresh fruits and vegetables per day, and 72 percent are obese or overweight, according to the Public Health Management Corporation. Many of these individuals are low-income and lack ready access to fresh produce in their neighborhoods. They may also have problems shopping and preparing meals due to lack of transportation and physical frailty. In addition, they may lack knowledge of proper nutrition. GenPhilly will hold a free forum on Wednesday, March 20 to discuss ways to increase food access and nutrition and highlight innovative food access programs around the country which might be replicated in Philadelphia. 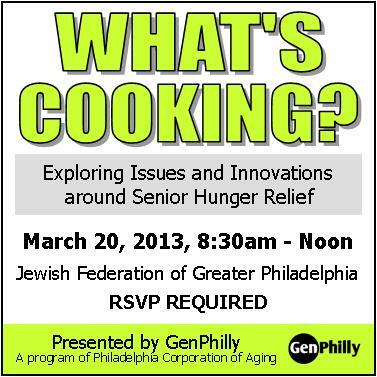 The event will take place at the Jewish Federation of Greater Philadelphia, 2100 Arch Street in Center City, from 8:30 a.m. to 12 p.m. RSVP required.